Recipe submitted by Chef LaLa, Speaking of Women's Health Keynote Presenter. This recipe was named after the chef's mom, Raquel, who is a great cook. She created great memories for her children around the dinner table, and now you can share this delicious dish with your family. Place meat, potatoes, ground beef and water in pot. Cover and cook over low-medium heat for 20 minutes, until potatoes are tender. Mash the meat and potatoes together with a potato masher. Mix in 1/2 teaspoon of salt. In a blender, add reserved juice, canned tomatoes, 1/2 teaspoon of salt, garlic cloves, onions, Serrano chiles, stock, tostada (to thicken sauce), pepper and cumin. Puree and transfer sauce into a saucepan. Dip tortilla into saucepan; carefully and quickly transfer onto a baking pan. Spoon 2 ounces of meat/potato filling onto the tortilla in an elongated manner. Roll the tortilla with the seam ending up at the bottom. Arrange rolls closely to one another. Repeat with each tortilla. Cover with more sauce. Place in an oven for 5-7 minutes at 375 degrees. Sprinkle with crumbled cotija or queso fresco. 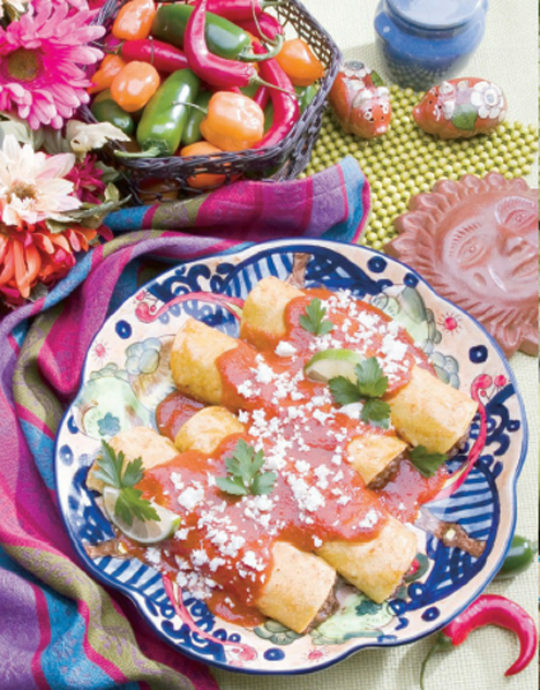 Each recipe makes 14 enchiladas.